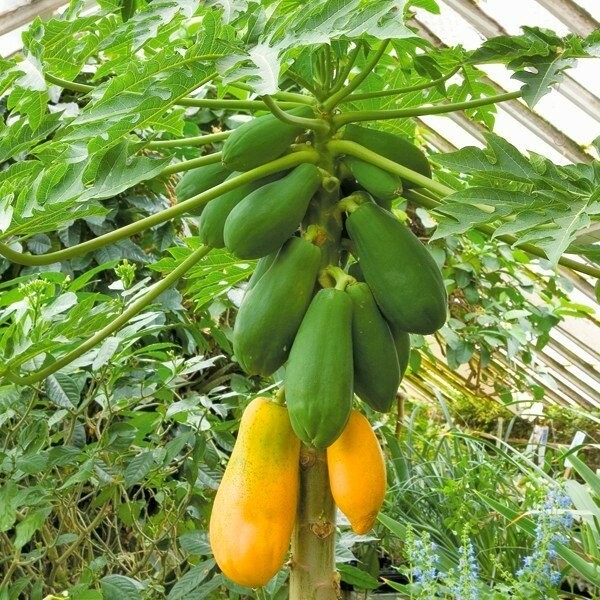 The papaya, or paw paw as it is also known is a deciduous fast-growing shrub or small tree that grows best in tropical and subtropical climates, so is best suited to a greenhouse or conservatory in the northern european climate, at least in the summer month. Under these conditions it can flower continually, although it will more likely perform from high Summer to early Autumn. Best fruit production comes in full sun, but it will tolerate shade. For best results grow in rich, well-drained soil, and if keeping outside all year round, mulch heavily in winter. Our papaya trees are supplied in approx 3 litre containers at around 100cms tall on delivery.